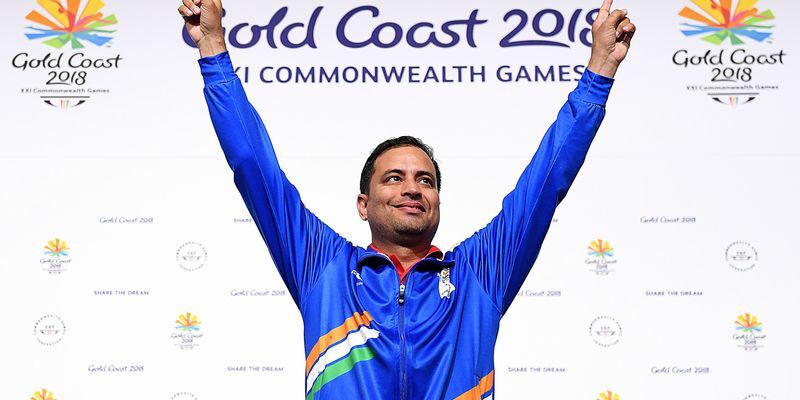 Indian shooters continued their dominance in CWG Gold Coast through Sanjeev Rajput as he finished the 50m 3 Rifle Positions with a Commonwealth Games Record score of 454.5. India’s representative in the event, Chain Singh, however, could only finish in the fifth position with a score of 419.1. The way Sanjeev had started off the event in the qualification stages was enough to indicate that he would bring a medal eventually. However, if there is one thing that Gold Coast Commonwealth Games has taught us, it is that one’s form in the qualification stages doesn’t matter. Hence, despite finishing the qualification with a score of 1180-58x, many had their doubts. And those fears found further ground when Sanjeev could score only 105.0 in his kneeling round finishing third best after Canada’s Grzegorz Sych and England’s Cameron Pirouet. Chain Singh was further down with a score of 149.3. However, Sanjeev improved his prone round score to 306.9, which was second highest only to Sych. It was in the elimination stages that Sanjeev notched up the gear. He started off with an impressive 405.6 and never dropped her shooting score below 9. Although he faced some nervous moments in the third and fourth elimination round with scores of 9.0 and 9.2, he was far ahead of second-placed Sych by then. And in the all-important final round, he outplayed the Canadian by a margin of 4.3. Chain Singh was eliminated in the second stage of the elimination round with a score of 419.1. Sanjeev Rajput takes India’s Gold tally to 20, with the total tally to 47.